There's a new trail in Freeville NY that has only been there a couple of years. At the far end of the trail somebody has made this very primitive bench. 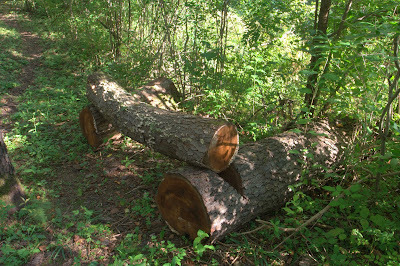 They cut two notches in two pieces of log, and placed another log on top of the notches. The pieces look like they all come from the same tree. Perhaps this is what one of the first wooden benches look like. Photo details: Exposure time 1 sec, Aperture f/16.0, ISO 100, Focal Length 20 mm, 35 mm equivalent focal length 32mm, Lens Canon EF 17-40mm, tripod. I think this primitive bench is a great find... now then.. did you try it out? Primitive works! By the time a hiker reaches the end of the trail, they are more than ready to sit awhile on such a sturdy location. I have a bench this week, too. Great find! I have many benches on that line from Mount Rainier and one of these days, I will get them posted. Most of mine are two logs for the base and then a split log for the top so it has a flat seating area. My Friday bench is now up so I hope you will come back for a look. Not even 7:30 PM here on Thursday night yet but I posted it early as how people were already visiting since Rune is ahead of us in time. Keep it simple! :-) You can sit on it, enjoy life and the view and it fits in very well with the scenery. My favourite kind of bench! Mine's posted. I think this is quite a nice find! Someone was thoughtful to take the time to make it. A bench, by any definition, is a bench. Love this.